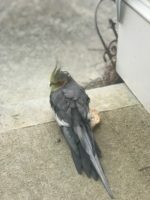 Found male cockatiel on porch in Buford, GA, near Mall of GA by young man who gave the bird bread and was to also give water. He is afraid to handle the bird. Called me to see if my lost bird, but not mine. His last name is Randall at 678-446-6841. Please Post!